Variable-cost pricing offers an adventurous variation on cost-plus pricing. 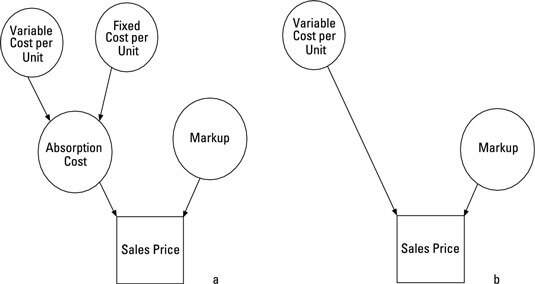 Instead of adding a markup on total cost, variable-cost pricing adds a markup on just the variable cost. It disregards fixed costs altogether. The figure compares variable-cost pricing with boring old cost-plus pricing. Suppose that Sparl Industries makes the Red Rover model. The entire production run of Red Rover requires $900,000 worth of fixed costs. Each unit costs another $90,000 in variable costs. Sparl wants to earn $400,000 in profit on the production and sale of 20 units of this model. According to this analysis, if Sparl Industries wants to earn $400,000 in profit and cover $900,000 worth of fixed costs by selling 20 units, it should set the sales price at $155,000. Variable-cost pricing is especially useful for companies pricing special orders when they have excess capacity, meaning they have sufficient resources to produce more goods. However, when operating at full capacity, variable-cost pricing may be hazardous to the health of your business. Suppose that you operate a hotel with vacant rooms. Each room has a variable cost of $10/night, and a fixed cost of $90/night. Cost-plus pricing requires you to base your price on a total cost of $100/night. However, variable-cost pricing allows you to base your price on a variable cost of just $10/night. If your hotel has vacancies (read: excess capacity) and a customer walks in without a reservation, offering to pay $52 for a room for the night, variable-cost pricing indicates you should take the guy in. After all, $52 exceeds the variable cost of $10, increasing your profits by $42. (Cost-plus pricing tells you to throw the customer out. Each room costs $100/night. Why would you willingly lose $48?) But if your hotel is completely booked, the only way to house the $52 customer would be to throw a full-price-paying customer out on the street, reducing revenue. Variable-cost pricing poses another severe danger: To earn a profit, your sales must exceed costs. Because variable-cost pricing doesn’t fully account for fixed costs, it can trick managers into setting prices so low that they hurt profits, or worse yet, cause net losses. Occasionally selling a room for $52 may increase your profits. However, selling too many rooms at such low prices (even if you’re never at full capacity) will cause you to lose a lot of money.